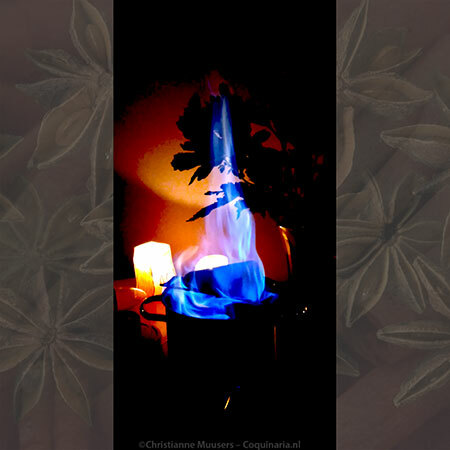 The first recipes for 2019 both concern hot, mulled wine. To accompany these wines, I have added this recipe for cheese biscuits from a French cookery book that we used for our Christmas dinner 2018: La cuisine de monsieur Momo, célibataire. This was originally published in 1930. These biscuits were served with the apéritif. The cookbook was brought to my attention during a presentation in October 2018 from Diana Kostman and IJsbrand van Dijk from Artemis Omnibus. The cookery book is written by a personal friend of the painter Henri de Toulouse-Lautrec (1864-1901), Maurice Joyant (1864-1930). He was an art dealer, and after Toulouse-deLautrec’s death appointed as his executor by his father. During Henri’s life-time, he, Maurice and several friends used to gather to prepare and enjoy lavish meals. The recipes from the cookery book are from that period. Sometimes they are written with tongue-in-cheek, like the recipe for Civet de marmottes which begins like this: “Having killed some marmots sunning themselves belly up in the sun with their noses in the air one sunrise in September, [ …]” (quoted from the English translation by Margery Weiner, see bibliography). But in general the recipes are quite good and easy to translate to the modern kitchen, even when some things would ne done differently today. More on that will be published in another recipe later this year. The picture above is a portrait of Maurice Joyant, painted by De Toulouse-Lautrec in 1900. 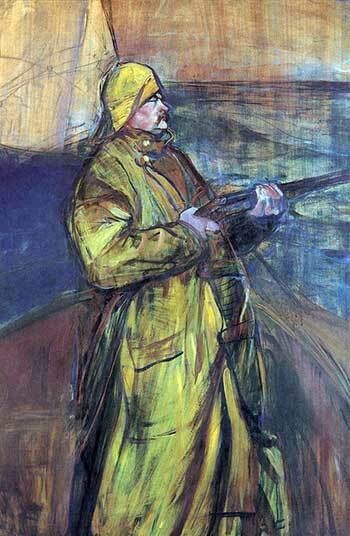 Maurice is standing on a boat in the bay of the river Somme, holding a gun in his hands. He is hunting. On some websites this painting is called ‘Maurice Joyant at the Duck Shoot’, and indeed, the cookery book contains several recipes for wild duck. But I like to think he is hunting snipe. These wading birds (Gallinago stenura) were also hunted with guns and dogs, and because of the erratic flight pattern of snipes, it was a difficult bird to hit. The word sniper for sharpshooter is derived from the snipe hunt. This French hunting website describes this hunt as “[u]ne chasse difficile, pour un gibier roi” or a difficult hunt for a royal game [bird]. However, at least in the Netherlands, this bird is a protected species and may not be hunted. So just be satisfied with these cheese biscuits. The original French recipe is from the new edition of 2011. The English text is from the translation by Margery Weiner in the English edition. See bibliography. Mélangez cent vint-cinq grammes de farine, soixante-quinze grammes de fromage râpé, de gruyère ou de parmesan, du sel et du poivre de Cayenne, une demi-cuillerée à café de levure alsacienne. Après avoir pétri, ajoutez soixante-quinze grammes de beurre et un jaune d’oeuf. Étendez la pâte et coupez-la en lanière ou en rond. Vernissez au pinceau avec un jaune d’oeuf. Mettez à four chaud, dix minutes environ. Mix one hundred and twenty-five grams of flour, seventy-five grams of grated cheese – Gruyère or Parmesan – salt and cayenne pepper, half a coffee spoon of Alsatian yeast. When you have kneaded it all together, add seventy-five grams of butter and the yolk of an egg. Lay out the paste, cut it in strips or rounds, glaze with an egg yolk, put it in a hot oven for about ten minutes. baking powder rather than yeast, as the dough does not need to rise. 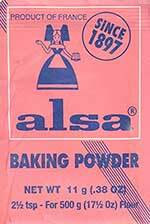 There is no need to buy this specific baking powder, I just used the baking powder I always use, with excellent results. The recipe mentions Gruyère of Parmesan as cheeses that can be used for the biscuits. I prefer Gruyère, as it is a softer, moister cheese; Parmesan makes the biscuits too hard and dry to my taste. And finally: the seeds that are sprinkled over the biscuits before baking is my addtion, they are not in the original recipe. Snack, about 40 biscuits; preparation in advance 10 minutes; preparation 25 minutes. Take the butter from the refrigerator at least 30 minutes before using it. Grate the cheese on a coarse grater. Mix the flour with salt, cayenne pepper and baking powder. Do not skimp on the cayenne pepper, the spicy accent is the making of these biscuits. Add cheese, butter and an egg yolk, and knead into a dough. If the dough remains too dry (crumbly), add some water, one teaspoon at the time. Keep the dough wrapped in plastic until further use. Use at room temperature. Sprinkle the work top with some flour. Roll out the dough (also sprinkled with flour) into a sheet of 4 to 5 millimeters thick (slightly less than a fifth inch). The dough can be sticky because of the amount of butter, but it can be done. Otherwise, just flatten the dough with the palm of your hand to the right thickness. Sprinkle more flour over the dough and on the worktop, flip the dough to the other side, to ensure that it does not stick to the worktop. Cut out the cookies, or use a knife to cut strips, and place them on a buttered baking sheet or a silicone baking sheet. Beat the second egg yolk (or a whole egg) slightly, and use it to glaze the cookies. 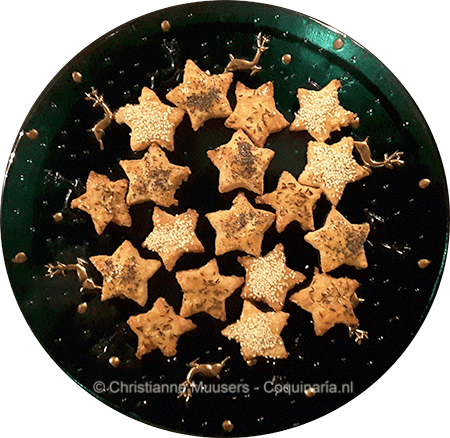 Sprinkle them with sesame seeds, caraway seeds or poppy seeds, or press an almond in the cookies. Bake the cookies in the center of the oven for about ten minutes, until they are a golden brown. Let them cool on a cake rack. These cookies are meant to be served with a drink, to make you thirsty. And believe me, they do! The cookies can be kept in a airtight container, and will remain good for several days, up to a week. They can be heated for a few moments in the oven on moderate heat. Do not use a microwave. Pittige specerij, gemaakt van vermalen gedroogde rode pepertjes, in het bijzonder van de gekweekte variant ‘cayennepeper’. Dit is een gemiddeld hete peper, de naam komt volgens de Engelstalige Wikipedia van quiínia een woord uit het Tupi, de taal van de oorspronkelijke bewoners van Brazilië. Je kunt niet gewone peper als vervanging gebruiken, maar wel andere gemalen gedroogde rode pepertjes. Veel Franse recepten vragen om Gruyère, en dat zou dan natuurlijk Franse Gruyère zijn. Maar die zie je vrijwel nergens in de winkel, wel Zwitserse. En dat klopt ook wel, want Gruyèrekaas is genoemd naar de stad Gruyères in het westen van Zwitserland. De kazen die aan de Franse kant van de grens worden geproduceerd, vallen niet onder de AOC (Appellation d’Origine Controlée) Gruyère, zij worden verkocht als Comté en Beaufort (of Belfort). De officiële Franse AOC Gruyère verschilt in een belangrijk opzicht met de Zwitserse: de Franse is een gatenkaas, de Zwitserse niet. Comté en Beaufort zijn wat dat betreft gelijk aan de Zwitserse Gruyère. Maar in dezelfde streek (Franche-Comté en Rhône-Alpes) wordt ook de Franse Gruyère -met gaten- gemaakt. Overigens, de grootte van die gaten is door de overheid nauwkeurig vastgelegd: “des ouvertures de dimension allant de la grosseur d’un pois à celle d’une cerise”. (dus tussen het formaat van een erwt en een kers in). The editions below were used by me. Links refer to available editions. Maurice Joyant, La cuisine de monsieur Momo, célibataire. Pellet, 1930. These French cheese biscuits from around 1900 are quite wasy to make, and the taste is excellent. 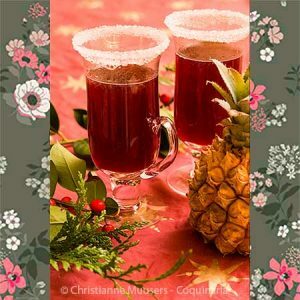 Coquinaria is not a commercial website, all information and recipes are free. If you appreciate this, it would be great if you show this by making a small donation!